45,000 Told To Evacuate German Town Before Massive WWII Bomb Is Defused : The Two-Way The bomb with its 3,000 pounds of explosives is thought to have been dropped by the British Royal Air Force during World War II. 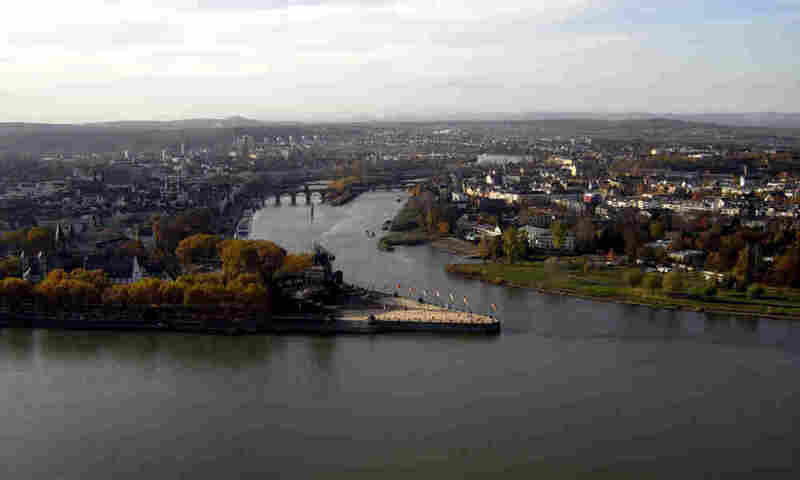 Koblenz: Where the Moselle river and the Rhine river meet. This upcoming weekend, a team of German explosive experts and members of the army are scheduled to defuse an unexploded bomb found in the city of Koblenz in Germany. The bomb — with 3,000 pounds of explosives — is a remnant of World War II that emerged in the Rhine River because of low water levels. How serious is the situation? Authorities ordered half of the city's residents — 45,000 people — to leave, while they get the job done. Stars and Stripes reports that the bomb is thought to have been dropped by the British Royal Air Force during the war and it is one of the largest bombs found in German history. "A 275-pound American bomb and a German smoke grenade were also found nearby," the paper reports, which adds that the British bomb is sitting on 16 inches of water, "partly buried in mud, making it difficult to access the detonation fuse."